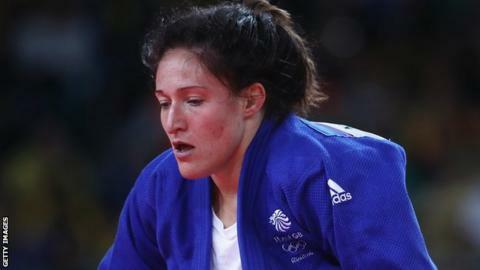 Britain's Natalie Powell missed out on the Dusseldorf Grand Slam podium after losing her -78kg bronze medal contest. The 28-year-old from Wales, who won bronze at the Guangzhou Masters in December, finished fifth after losing to Klara Apotekar of Slovenia. Max Stewart and Jemima Yeats-Brown had first-round defeats, while Sarah Adlington lost to world number two Larisa Ceric in round two of the +78kg. Sally Conway won gold for Britain in the -78kg on Saturday. Powell beat Brazil's Samanta Soares, the world number 22, with a single waza-ari in Golden Score. She then saw off Unelle Snyman of South Africa with a second waza-ari. But against Germany's Anna Maria Wagner, Powell was hooked by the ankles in Golden Score and forced to the mat, sending her into the repechage. In the repechage final she beat Russia's world number 27 Antonina Shmeleva, throwing her for ippon. However, she missed out on bronze as Apotekar registered single waza-ari, with Mayra Aguiar of Brazil taking gold. Stewart suffered a Golden Score exit to Altanbagana Gantulga of Mongolia in the opening round of the -90kg competition. In the -78kg, Yeats-Brown was defeated by Slovenia's Kiara Apotekar, the world number 11.